Steve Young appears on Ask Me Another at the Nantucket Film Festival in Nantucket, Massachusetts. 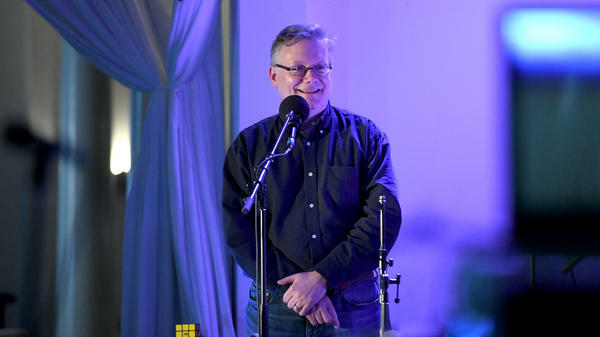 Comedy writer Steve Young is an expert on "industrial musicals," full-blown musicals written and performed at corporate functions. Young discovered these while seeking out oddball songs as a comedy writer for the David Letterman show; he's now featured in a documentary exploring the musicals, Bathtubs Over Broadway. Steve challenges Ophira, puzzle guru Cecil Baldwin and guest musician Julian Velard to an audio quiz where they try to identify the products associated with industrial musical songs. Heard on Francois Clemmons: From Mozart to Mister Rogers. While Peter and Sarah get ready for the final round, it's time for us to play a game. This is called Meet the Expert. Our guest expert today is Steve Young, who was a writer for David Letterman and is an expert on industrial musicals. His documentary is "Bathtubs Over Broadway." Please welcome Steve Young, everybody. EISENBERG: Steve, welcome. Thanks for coming on ASK ME ANOTHER. YOUNG: My pleasure, Ophira. Thank you. EISENBERG: So, explain to everyone what exactly an industrial musical is. YOUNG: Think Broadway musical, often extremely elaborate, full, huge money production, but the audience is all company insiders at a sales meeting or a company convention like BFGoodrich tire dealers. That the only people in the audience. And the musical is about the glories and triumphs and tribulations of being a BFGoodrich tire dealer. EISENBERG: We're talking full musicals like sets, actors, singing, costuming. YOUNG: Oh, yeah - in the glory days. Full-booked musicals with a large cast, tremendous scenery and costumes and props, a big orchestra in the pit - just reeking corporate money. EISENBERG: And how did you get interested in them? YOUNG: It's an excellent question. I knew nothing about Broadway theater or anything of this sort. I really shouldn't ever have learned about it. But working for David Letterman, we used to do a bit called Dave's Record Collection. And I would go out and find weird record albums that we could make fun of on the show, and I started coming back with these souvenir records. I think we can do something with this. It's a musical called "Diesel Dazzle," for instance. YOUNG: ...We're already home free. This is going to be hilarious and it was. But then, oh, my God, it is - there were geniuses working on this stuff because the money was great. And it could be a satisfying intellectual puzzle. Take the least likely topic for a musical and make it glorious and make people leave the theater just thrilled to be selling diesel engines. EISENBERG: Putting the dazzle in it. EISENBERG: So let's get your game. Steve, you've provided some industrial musical clips for us. We have the track titles but we don't know what these songs are about. So we're going to hear a clip, and then Julian, Cecil, and I are going to try to guess what the product is that they are singing about. And you can let us know how we're doing. Let's hear the first clip. This song is called "My Bathroom." UNIDENTIFIED SINGER #1: (Singing) My bathroom, my bathroom is a private kind of place. EISENBERG: How about a cleaning product? How about an air freshener? An air freshener. JULIAN VELARD: That's a good one. BALDWIN: ...go to be one of those two. YOUNG: Well, those are heroic tries but no, this is a song from the 1969 American Standard bathroom fixture musical called "The Bathrooms Are Coming." EISENBERG: The dark ages bathrooms. YOUNG: There are songs on the album about we're sick of these primitive old bathrooms our grandmothers had, things like that. EISENBERG: The next clip is called, "Sales Training." UNIDENTIFIED SINGERS: (Singing) Now you can fully explain heat loss and gain, air distribution too. And you have learned design and you do find a load estimating, cost calculating, salesman super dude. EISENBERG: Load estimating, cost calculating, salesman super dude? Julian? VELARD: Is this about insulation? EISENBERG: Insulation? That's what you think? EISENBERG: That's a good idea. BALDWIN: I was going to say, a calculator? BALDWIN: Oh, is it like air conditioning ducts? EISENBERG: Is it from the musical "Duct Yankees"? YOUNG: I'm sure there was one called that but, no, that's not it. YOUNG: You could have a bright future in this field, by the way, because they love that sort of pun title. No, this was York air conditioners' sales training song. EISENBERG: You sort of got it. EISENBERG: All right. This next clip is called "1265 And 1260 (ph)." UNIDENTIFIED SINGER #2: (Singing) An automatic builder of your sales is next. It's a factor accumulation or summation X. Automatic rounding? Double zero round off too? EISENBERG: I don't know any of those words. My cultural anthropology degree is really failing me right now. Plumbing - something to do with plumbing. EISENBERG: I'm going to say sewage - a pump - a sewage pump. BALDWIN: This is the weirdest "Fugue For Tinhorns" that I've ever heard. BALDWIN: A crush on the head. YOUNG: I know. It's all - it's all out of whack but you're trying so hard. So thank you. EISENBERG: The calculator. This next clip is called "Be Direct With Me." UNIDENTIFIED SINGER #3: (Singing) Two straight parallel wires bearing current in the same direction attract each other, if you know what I mean. BALDWIN: I don't know what she means. EISENBERG: I don't know what she means. BALDWIN: I don't know what she means at all. VELARD: Cecil, you know what they mean. BALDWIN: Whatever Lola wants, Lola gets fixed by the electrician. EISENBERG: ...Electrical wires outside, you know? YOUNG: Yeah, you know what? I think we should just - I mean, you're generous giving things to the contestants. I will give that to you. That's General Electric, the 1966 utility executives conference show, which was written by John Kander and Fred Ebb just a few months before they wrote "Cabaret." EISENBERG: Steve, thanks for sharing these ridiculous and amazing clips. Steve Young appears in the documentary "Bathtubs Over Broadway." You can find screenings near you at bathtubsoverbroadway.com, and his book on industrial musicals is called "Everything's Coming Up Profits." Give it up for Steve Young, everybody.